Quest for Inter-City train: While unfortunately I only had the 7710 Push-Along Passenger Steam Train as a child (plus something like the 5005 Battery Box and some kind of 4.5V LEGO lighting that I hodgepodged on the train at some point), one of the really cool things about the LEGO Trains of the 1980s were their modularity. Not only were there push-alongs, 4.5V battery powered trains and 12V mains powered trains, but you could buy expansions packs to upgrade your trains and tracks later, even from motor-less to motored, from battery to 12V. For example, the 7865 Motor Replacement Unit for Battery or Motor-Less Trains was not only good as a spare part, it also included instructions how to replace the push-along wheels on the 7810 Push-Along Steam Engine with the 12V train motor – the upgrade set included all the extra parts needed for this too, like the weights. Also the 7861 Lighting Set Electric 12 V allowed lighting upgrades to trains, stations etc. Its instructions show how to add lighting to e.g. the 7725 Electric Passenger Train Set, that shipped without lighting. Now that I have acquired the 12V train motor for my 7740 Inter-City Passenger train build, it was time to wrong a right from all those years ago – re-build the 7710 Push-Along Passenger Steam Train locomotive with the 12V train motor underneath. 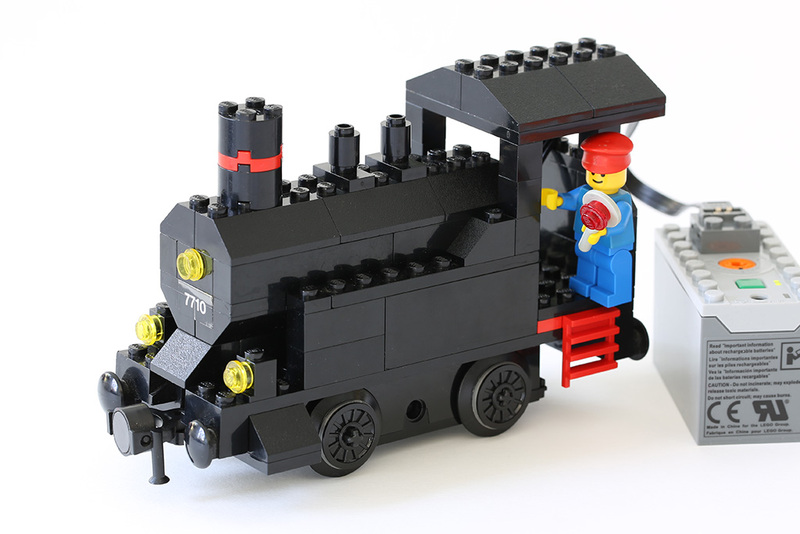 The mod is the same as with the 7810 Push-Along Steam Engine, replace the bricks on the side of the train with weights and the wheels with the motor, adding the two filler plates needed over the motor. (I only had one black weight, though – from 4010 Police Rescue Boat – but it works fine when put on the inner edge of the driving direction.) The 12V motor even has a secondary power port on top for this configuration, so that lighting can be added to smaller trains. Lighting isn’t that easy for this particular locomotive, though. 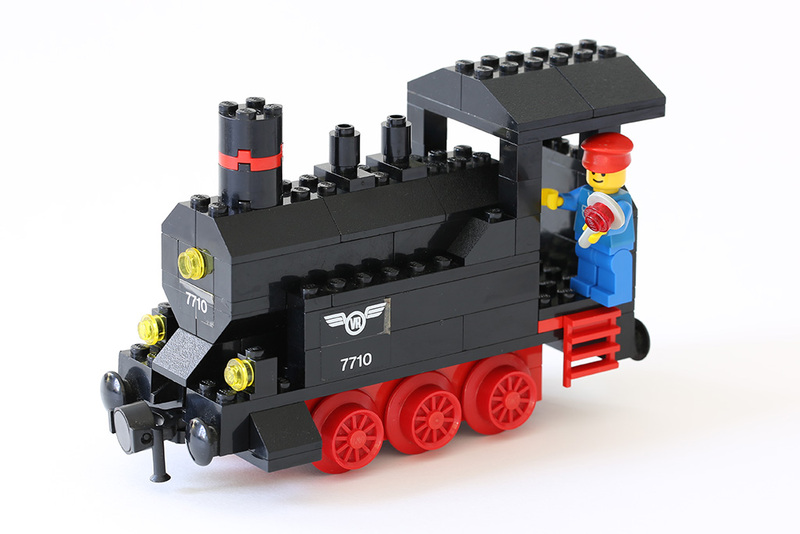 The 7710 Push-Along Passenger Steam Train locomotive can’t be lit up without slightly altering its appearance and structure. You could push the lights back one stud and put a black light prism holder there; put the light prism holder in the same spot as the lights and add black 1×1 bricks behind it to hide the light brick and limit rear light leakage; or simply leave the lights as is and put a light prism holder behind them… But whatever the solution, you would also need to re-do parts of the middle and back, swapping plates to smaller ones and leaving suitable holes to fit the power cabling to the motor and to a secondary light brick behind the locomotive’s top third light. TLG still continues this great upgrade (and up-sell) tradition today, although of course the 1980 LEGO Trains remains unparalleled in its diversity. Power Functions can be added to some push-along sets later on and even the instructions are included. 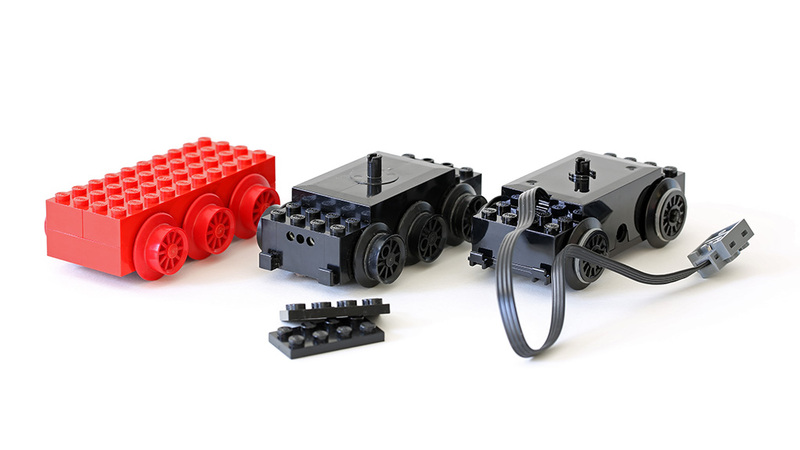 Also, the Power Functions train motor is still compatible with the old 1980s LEGO Trains and could be used to upgrade, say, the 7710 Push-Along Passenger Steam… just add the two 2×4 plates to the PF motor – to play, you’d also have to stow away the battery pack in the passenger wagon. P.S. 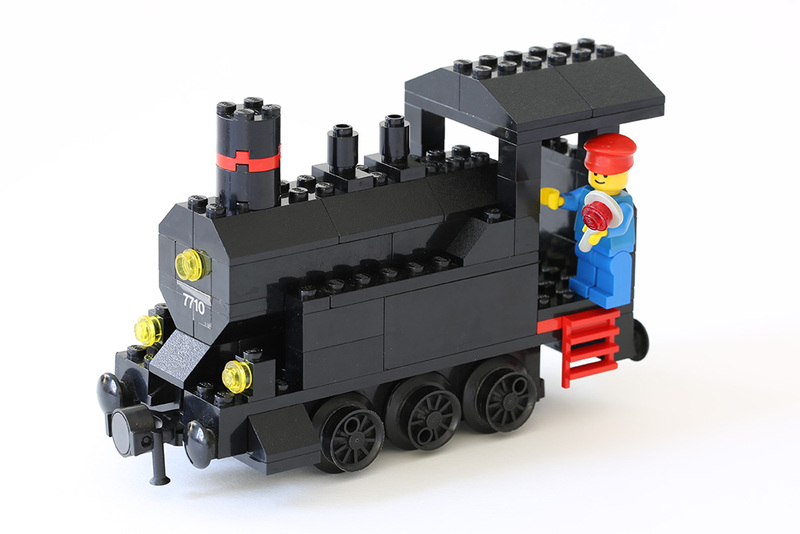 If you ever need to try and open a 12V LEGO train motor, Eurobricks has pictures.